Loving this background. 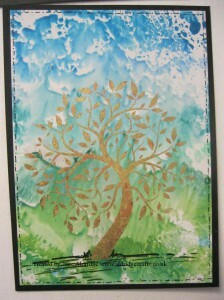 I thought I would experiment with Distress Paints onto glossy cardstock. 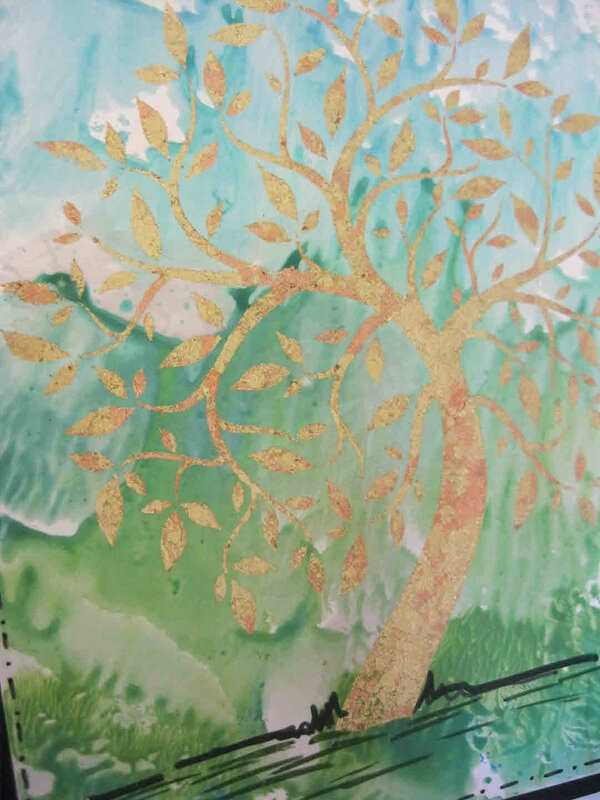 I put the paint onto my craft mat (I used lots of shades of blues and greens in vertical stripes running from blues to greens) and spritzed with a little water and then dabbed the card into the paint. As it is glossy card, the paint sits on the surface so you get these fabulous patterns. It immediately made me think of blue skies and green fields and so I thought the IndigoBlu Treemendous stamp would be perfect to use on it. I made sure it was completely dry before using flitterglu and flakes to stamp the tree image. It was floating in the middle of the field so I used a black pen to scribble some lines and a few zigzags to give the impression of grass.